Oct. 13 will mark a change in aviation in the Dallas area as the 35-year-old Wright Amendment officially comes to an end, leaving downtown Love Field and its hometown airline, Southwest, free to pursue flights across the country. What does this change mean for the future of the two major airports serving Dallas — Love Field and Dallas/Fort Worth International Airport (DFW)? The Wright Amendment became a reality in 1979 following the opening of DFW a few years earlier. The two cities sharing this new airport agreed to limit traffic at their own airports — namely Love Field, Addison Airport, Fort Worth Meacham and Fort Worth Alliance. The agreement also encouraged airlines flying from these airports to relocate to the new facility, centering air transport in one location. The Wright Amendment put limits were on nonstop flights travelling outside the state of Texas, unless they originated from DFW. This immediately had an effect on the small Southwest Airlines, which had been challenging the big carriers of the time with its low fares between cities in Texas, particularly from its Love Field base. Southwest wanted to expand outside Texas after the Airline Deregulation Act of 1978 permitted greater freedom on where carriers could fly. However, a move to the expensive new airport was out of the question for the thrifty airline. Some limits were lifted in 1997, and again in 2005, ultimately allowing nonstop flights to four additional states. 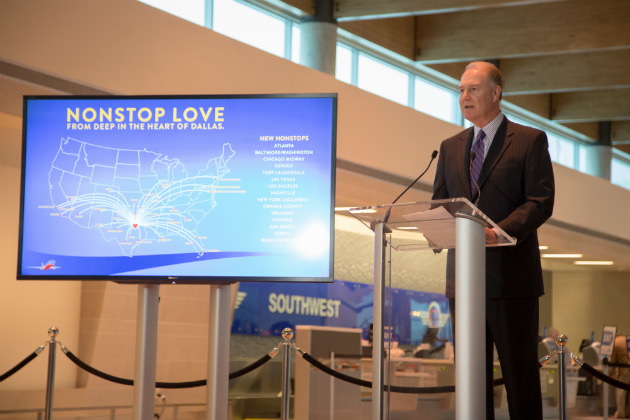 Southwest responded with new routes, and the threat drew American Airlines back to Love Field to try and compete on flights to the permitted states. Fast forward to today, and — after much wrangling — the days of the Wright Amendment are now numbered. Southwest Airlines responded with the announcement of 15 new routes to be added from Love Field, starting the day the Amendment ends. Destinations are primarily other Southwest hubs, such as Baltimore, Chicago, Las Vegas and Denver. A month later, other Southwest hubs will be added, such as Atlanta, Los Angeles, New York LaGuardia, Orlando, San Diego and Washington Reagan National. 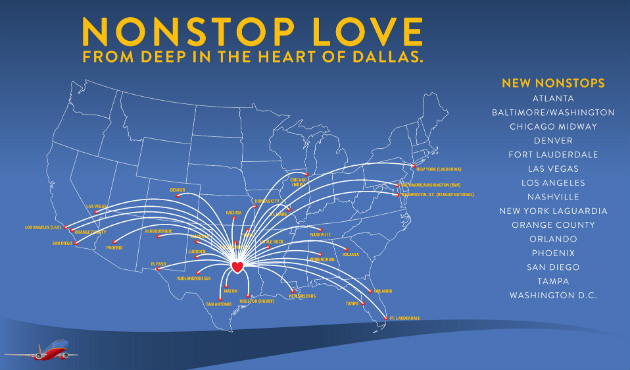 Interestingly, this mass expansion at Love Field leaves Southwest with limited resources at other bases, and it will need to curtail services on existing routes from its network, which in many cases will now result in passengers enduring a one-stop service where they used to have nonstop. For DFW, the end of the Wright Amendment is sure to spark a large-scale fare war among airlines serving the area. DFW is served in its own right by low-fare carriers such as Frontier and Spirit Airlines, and its largest customer (American Airlines) has only recently emerged from Chapter 11 bankruptcy protection. Add to the mix the recent improvements being carried out at Love Field — including a new railway station — combined with its close proximity to downtown Dallas, and you may come to realize that a real fight will be going on. However, the scale and limitations of Love Field will always limit growth to anywhere near the size of its rival — a reason for building the new airport in the first place. But let's not forget that the Wright Amendment only existed in order to boost a new airport that is now 40 years old, and the anger and hatred stirred up was never the intention. From October, passengers flying to and from Dallas will have great choice and competitive fares from which to choose.